​​This Champagne, produced of only white champagne grape type, called Chardonnay, is not fermented by the malolactic fermentation. Unique, because it is a vintage wine, we have allowed ourselves to call it Excellence. The spirit of Blanc de Blanc, its fine flavours and complexity, bring its perfect taste to roast poultry meals. Conservation: Can be drunk now, but feel free to keep it in a good cellar for another 5 to 10 years. Aging: This champagne has aged for over 10 years in our cellar and has matured another year after the disgorgement for a full development of aromas. 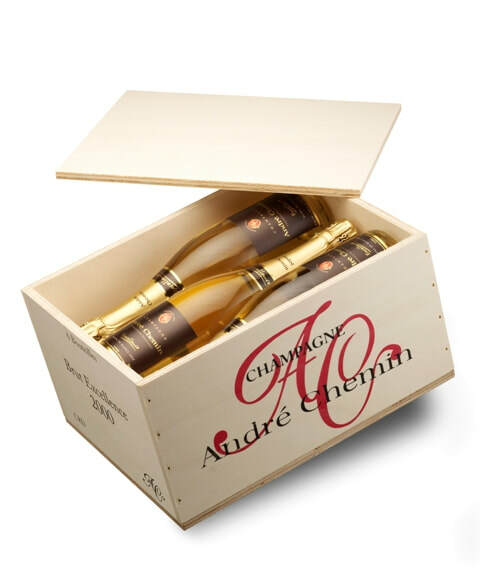 Size: Bottle 75cl, classic champagne bottle.​ Available in wooden six-bottle boxes.